The telescopic C-mount lens in the picture directly below is NOT included in this auction. Click here to see more. These last three images, just above, show how I set up my camera's power for remote shooting. 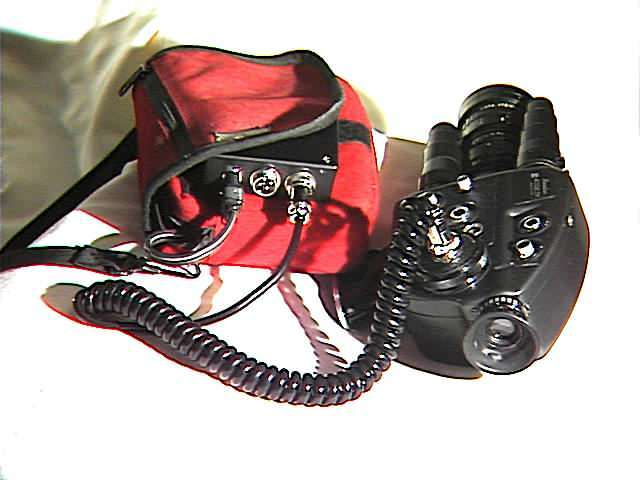 The red belt/shoulder bag holds the Sony BP-90 Ni-Cad Battery and a custom dual-voltage reglator. 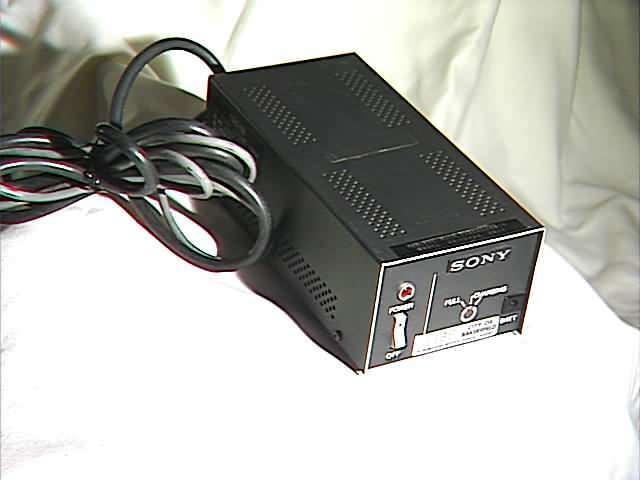 The final picture shows a compatable Sony battery charger with power supply. Just guessing, this might power through 100 rolls of film and give one lots of time for zooming and adjusting for perfection. Custom Dual Voltage regulator with coiled power cable and camera adapter plug ready to accept battery power. 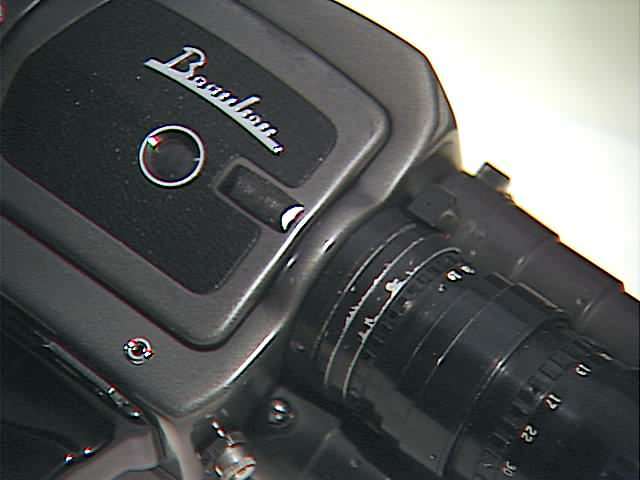 Original Beaulieu charger that came with the camera when new. Condition of the camera is generally pretty good. It has worked well for my purposes. The manual recommends lubrication of the camera by factory trained technician every 3 years. This has not been done since I have owned it, but it has spent considerable time in storage during its 9 years in my possession. The power zoom on the factory Angenieux lens works well, makes a little sound when set to highest zoom speed. This is common. I just tried a friend's lens and it sounded identical. The reglomatic system which drives the aperture on the factory Beaulieu lens when in automatic mode has never functioned properly since my ownership of the camera. Apparently this is an extremely common occurrence on older Beaulieu models, and fortunately not of much consequence. The manual adjustment works fine and is the superior method of setting exposure for all professional applications. Also, manual mode is the only way to set exposure on most C-mount lenses. "As these cameras age, it is quite common for the metering system to begin to lose accuracy, the galvanometer (meter needle) to become inactive, and for the automatic reglomatic system which drives the lens aperture to become sluggish and/or not work properly." "It is often best to use the camera in manual mode anyhow, just as you would any professional camera. It also has a tendency to vary the exposure somewhat when set to automatic or manual when in non-running mode as compared to when it's in operation. This is due to the guillotine shutter interfering with the meter reading, and cutting down some of the light the meter receives." "Also, try to avoid using the camera in automatic when shooting any slower than normal speed, since the shutter system will severely begin to affect the auto-exposure mode." but worked fine in manual mode." and usually with a handheld light meter (unless the built-in one is still functioning well)." 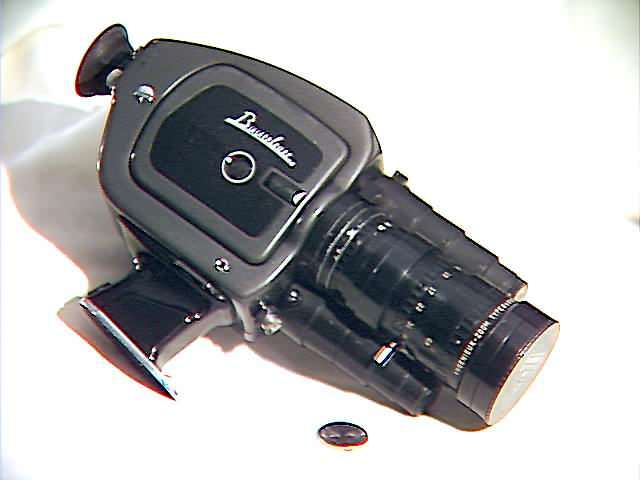 "In closing, I would like to add that the BEAULIEU Super 8mm movie cameras are quite capable machines, and will deliver some of the sharpest and steadiest Super 8mm footage you have ever seen." 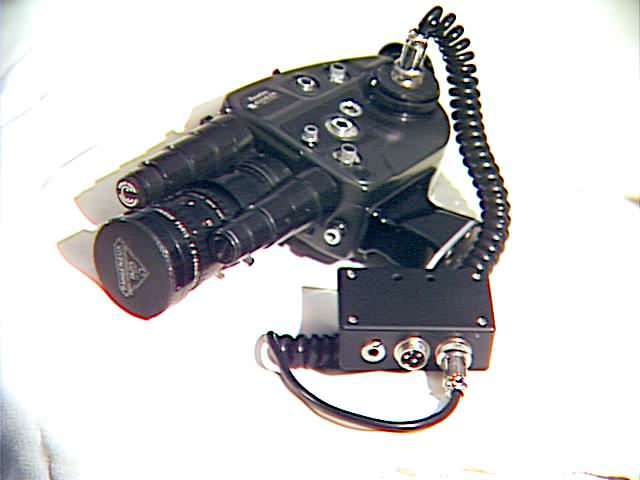 Although this page looks similar to my Ebay ad, it has expanded information and links that most Beaulieu fans would appreciate..
Another Gift 4 U: Instruction manual for operation of a 4008 ZMII Somebody so nicely scanned and placed on the web. This is almost identical to the 4008 ZM manual which is provided with my camera. Unfortunately, you must download and save each page individually. This document is available this week only! As I understand it, 70 fps is about the limit for Super 8. I have shot at that speed with great success. BTW: I used to have a movie miniatures company. What are you shooting that requires slow motion? Water in a pool, needing to look like big slow moving waves? This camera does single frame animation of course. One book I have says that nobody besides Beaulieu has dared go beyond 54 frames per second. Lenny Lipton, a film and camera expert, in his book "The super 8 book" has these comments based upon his own tests. "At the extreme slow-motion end, 70 fps, which I suppose could be called ultra slow motion for a super 8 cartridge-loading camera, things aren't so good. Nobody else has dared to go beyond 54 fps, I think, because of the convoluted path the film travels through the cartridge. The extra drag on the film, designers must have reasoned, would cause too much tension and unsteadiness." "At 70 fps, I suspect this is exactly what is happening in the Beaulieu. It isn't very steady. You will probably find that the registration is acceptable for many slow motion subjects. None of the people who looked at my footage thought it was unsteady, but I did." 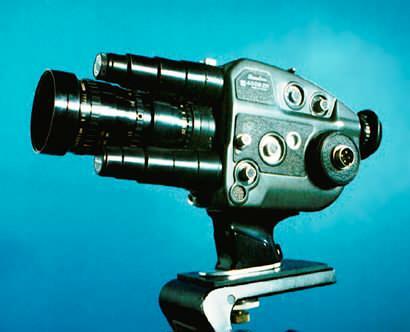 "I think this is one of the world's most finely manufactured cameras."
. my precious Beaulieu 4008ZM. Its been sitting on my shelf too long, and I need the money to help finance my current project. I purchased this fine camera used, in 1996, from a camera dealer in Santa Cruz, CA and used it for special film projects and effects. 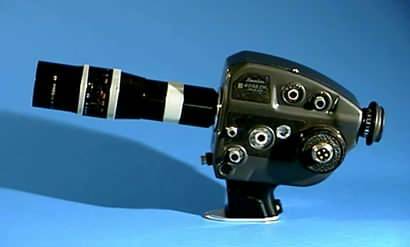 At that time, I owned a video production company, and had requirements that video cameras and most small film cameras lacked. If you are reading this, then you probably know this camera and its features already. If not, or if you want to learn more, I have place the complete original sales brochure online for you to download, albeit one page at a time. Click the orange picture above to download the original sales brochure. 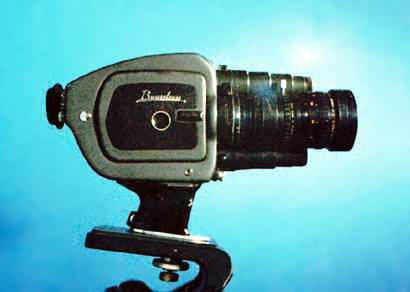 Film Type and Film Speed: The ASA could be set at levels way beyond commercial super-8 film available at the time. I often purchased the latest professional negative film stock, for transfer to video for later editing. Contrast ratios and resolution are superb compared to video and we could pick up elements out of the shadows during transfer when we chose, almost like getting to shoot it a second time. Speed, Fast and Slow Motion: I made particular uses of this camera's ability to shoot wonderful slow motion sequences, as it is capable of firing off anything between 2 fps up to 70 fps (frames per second). In my case, shooting a waterfall at 70 fps, played back at the normal 18 or 24 fps, you could see every splash and droplet flying through the air in beautiful dreamy motion, something a digital video camera, with all is bells and so-called high-tech whistles cannot duplicate with such natural smoothness. Another time I filmed my daughter doing cartwheels, and had a beautiful record of every body movement, again not possible without film (Some may try, very expensively, to simulate this with between frame animation). Lens Choices and Availability: I have used this camera with various C-mount lenses (See my Beaulieu information site) When using these alternate C-mount lenses, the camera is normally set to manual, and all settings can be done manually while viewing through the internal lens meter, or better yet, with an hand held light meter, the professional way. Accuracy: Other uses were for special legal situations, where precise lighting reproduction, contrast ratios and coloring of critical scenery were required. 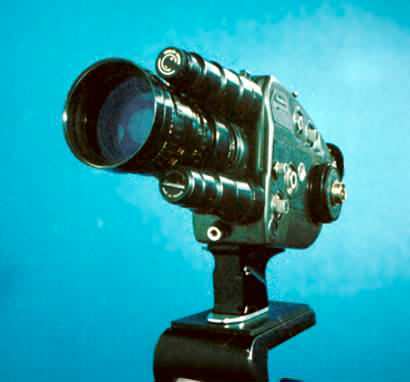 The best video cameras had previously failed. This camera filmed all accurately and successfully. The original battery was long expired when I purchased the camera. Small and expensive, the original battery puts out two separate voltages at the same time to the camera. Rather that purchase another with its limited power, I chose to assemble a special dual voltage regulator, one that would permit use of an my external rechargeable battery packs, battery belts, and even a car battery to power the camera. A machine shop carefully removed the lid of the old battery for me, which I modified to accept a power cable. I used a 12-volt battery most of the time, but anything above 7.2 Volts and possibly up to 24 should work. I kept the regulator in a small pack with my new larger battery. I am keeping my current battery, as it powers other video equipment still in my use. A rechargeable battery from Radio Shack for running remote control cars 9.6 volts with a charger is available for about $29.00 that would offer much more power than the original. "However, there is nothing wrong with the original battery pack, provided you have a new one, one in good condition, or have an older one re-celled as new. The limitation is that a fully charged original Beaulieu 4008 battery pack will only power approximately 5 to 8 cartridges, depending on which running speed you're using, if you turn off the power frequently when not using the camera, and how much you use the power zoom feature." "So from this you can see, that it is very handy to have an additional, or even several battery packs. Since they are quite expensive (about $150 to $190 each), you could easily pay more for just three battery packs than what you can buy the entire camera for! One solution is to use a battery belt set or larger external power source fed to the camera via the external power cord and the dummy battery socket (which replaces the NiCad battery in the camera's side)." "Alternatively, you can also make up your own power supply, if you are knowledgeable enough... since you don't want to damage the delicate light metering system." -- and another to power the light metering system (approximately 4volts)." 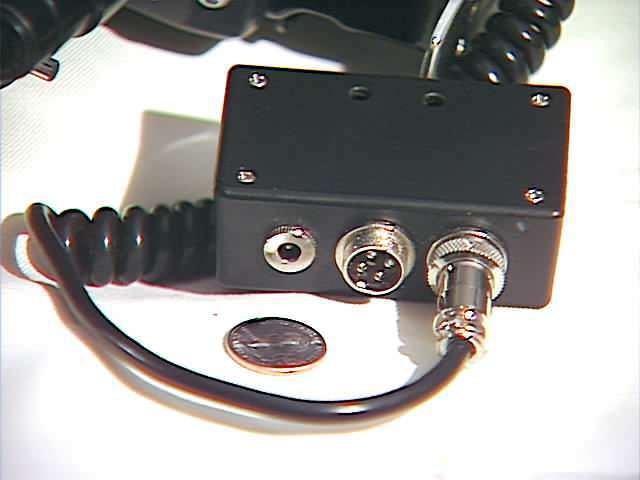 "Many have used video camera 7.2volt battery packs and made up their own power supply.... by still using the dummy battery socket and external power cord, and splicing the feed end of the power cord to the two different voltages (you have to operate on the video battery pack to run a line out for the lesser light metering voltage)." 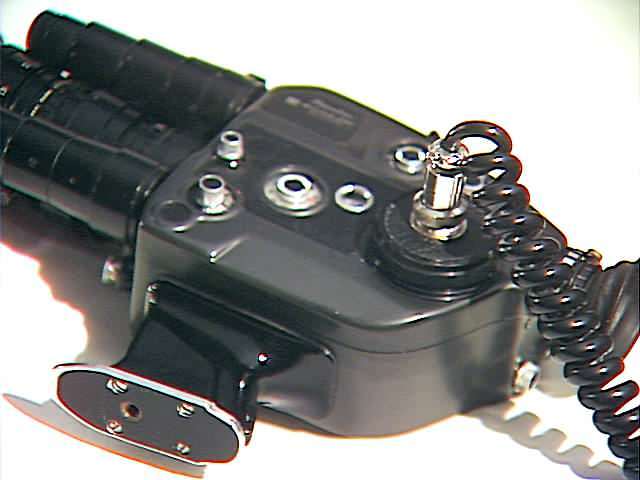 "Some have just tied in the 7.2 volts to power the motor and zoom only, and just left the metering system alone (especially if it's not working correctly anyhow, common on some very old 4008s), and used manual metering with a good hand-held light meter etc." Please read this all carefully and inspect the photos before bidding. All content c. 2001, 2004 by R. D. Nelson. All rights reserved.